AZUD - QGROW - Irrigation - Fertigation - Fertigation System by Sistema Azud, S.A. The fertigation is the simultaneous, controlled and localized application of water and fertilizers through the irrigation system. The aim of fertigation is to keep the availability of water and nutrients in the optimum level to obtain the maximum output in the available environmental conditions. The base of AZUD QGROW fertigation autonomous system is its injector, based on the “venture effect”. The low unitary cost of these injectors, together with the simplicity to install them in parallel, determine the use of the multi-injection systems AZUD Qgrow as the best option to the fertilizers supply. This fertigation system is adapted to the requirements of each Project. It permits the selection of the injection level demanded by the system, regardless of the flow rate and pressure, providing the dosage of nutrients, the installation and the maintenance. It does not need a specific energy source. The protection auxiliary elements are not necessary. It makes possible the use of open and suitable size tanks. Incorporation of several fertilizers simultaneously. It is not necessary the making of a mother solution. Covering the necessities in real time. Simultaneous supplying of fertilizers incompatible among them. Increase the application efficiency of fertilizers. Increase profitability. Traceability thanks to its information storage capacity. 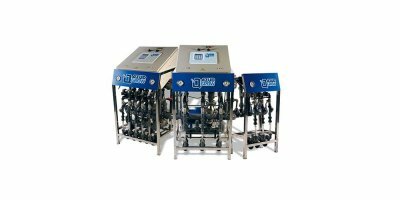 Furthermore, the system provides flexibility, versatility, the supplying of nutrients taking into account the application time and the proportional supply to the circulating flow rate trough the pH and EC control and safety (guaranteeing the injection levels). In short, AZUD QGROW offers maximum efficiency and effectiveness of the system. No reviews were found for AZUD - Model QGROW - Fertigation System. Be the first to review!